Disclosure: I have TSA PreCheck, a Clipper Card, and travel with carry-on bags. If you do not have TSA PreCheck, your security screening will take longer. If you do not have a Clipper Card, you will need to buy a one-way BART ticket prior to riding BART. If you need to check your bags, you will need to drop off your bags before going through security. With that said, here is how to get to the SFO Centurion Lounge like a pro. Good morning everyone, happy Friday. I fly out of SFO often and try to swing by the SFO Centurion Lounge as often as I can – even if it is just for a few minutes to grab a bite to eat before heading to my gate. I will show you how to get from San Francisco to the SFO Centurion Lounge like a pro. Since I work in San Francisco, I usually take BART (Bay Area Rapid Transit) to SFO. I jump on the yellow line headed to SFO and I can get there in under 40 minutes (make sure you are on the train that says SFO / San Francisco Airport). The SFO Centurion Lounge is located in Terminal 3 (the United Airlines terminal), near gate 74. Terminal 3 and the International Terminal G Gates (G91-G102) are connected by an airside walkway. Since Terminal 3 is always busy, I prefer going through the International Terminal G Gates TSA security (they have TSA PreCheck and CLEAR) and then walking to the Centurion Lounge in Terminal 3. After BART arrives at SFO, walk through the BART ticket gates to the International Terminal. Then go through security at the International Terminal G Gates (left side of the terminal). At security, show them your boarding pass and tell them that you are going to the lounge. If you do not tell them you are going to the lounge, they will most likely tell you your flight is departing from another terminal and not let you through security. If you have TSA PreCheck, you should be through security in under 5 minutes. After you pass through security, turn right and walk toward the new United Polaris Lounge. When you get to the United Polaris Lounge, turn left and go down the escalators to the airside walkway. Walk for 3-4 minutes until you get to Terminal 3. You should then see the SFO Centurion Lounge. Go inside the lounge and enjoy a nice meal and beverage before your flight. If your flight is leaving from terminal 1, 2, or International Gates A1-A12, you will need to leave security and walk to the terminal. You will then need to go through security again to get to your gate. When I fly from SFO, I usually fly Southwest Airlines, located at Terminal 1. From the SFO Centurion Lounge, it is about a 15-20 minute walk to get to Terminal 1. If you are flying from Terminal 2 (American Airlines, Alaska Airlines, Delta and others), you need to leave security and walk 10-12 minutes from the SFO Centurion Lounge. If you are flying United from Terminal 3, you do not need to leave security. Please let me know if this post was useful since I am considering doing a similar post for the Escape Lounge at Oakland International Airport (OAK), which you can access with your American Express Platinum Charge Card. If you have any questions about getting to the SFO Centurion Lounge, please leave a comment below. Have a great weekend everyone! This entry was posted in Credit Cards, Trip Reports and tagged American Express, AMEX, Bart, credit cards, Free Stuff, Lounge, Travel Credit Cards. Please note that there is no color code at BART station. When you are at BART platform, there is no yellow BART line, so just look up for electronic sign indicates San Francisco International Airport when the train is arriving . A small point, but the Clipper card is for all Bay Area public transit–a total of 22 systems–not just BART. Calling it a “BART Clipper Card” may suggest to people who use it routinely for another system that they have to get a separate card for BART, which is not the case. I usually fly Southwest in and out of San Francisco and have done this dance multiple times. I tell people about it and they look at me like I’m crazy but I think it is totally worth it. I timed us once and getting from the Centurion to our Southwest gate only took 12 minutes. My wife and I are fast walkers, though. You are really fast walkers. If you leave at the right time when terminal 3 and 2 are not busy, I could see it being an easy walk. Yes, the SFO Centurion Lounge does get busy. I am usually there on Friday afternoon from 5-7ish and its busy most of the time. Delta flies out of terminal 1, but I think it’s connected airside now to terminal 2 (but not sure never had to change terminals at SFO). Yes, you are right. Delta is located in terminal 1, but connected airside to terminal 2. We fly Emirates to the Maldives leaving San Francisco in the afternoon in January. Can you compare Emirates lounge versus the centurion lounge? Which would be better to spend time? I’ve never been to the Emirates lounge at SFO, so I can’t say for sure. I can go to the SFO Centurion Lounge anytime I fly from SFO, but if I was flying on Emirates, I would visit the Emirates lounge. You can always visit both, if you have enough time. HI Carl, Let me chime in on this. The Emirates lounge is wonderful. Go hungry and stay a long time! My pro tip: tell Uber driver or whoever is driving you to drop you off at Door 13, terminal 3. Fastest TSA checkpoint, CLEAR is on the correct side for TSA precheck (don’t have to cross all the way back across the line, if you know what I mean), and then Centurion lounge is right inside. I’m always max 2 min curb to lounge :) I LOVE SFO. That security area is only open certain times of the day, right? Everytime I walk passed at 5pm, it is closed. Is it possible to access it if you’re arriving at SFO? Yes, if you arrive at Terminal 3 (United Airlines flights) or at International Terminal G Gates. Any other terminal, you will have to go out of security and then go back through security to get to the SFO Centurion Lounge. Just wanted to update.. so I tried going to the centurion lounge after arriving at SFO from a diffeeent terminal. like you said, I left and tried to go through security on the other side of the airport but I wasn’t allowed. Seems like you can only access it while arriving when you’re arriving into that terminal. Yes. If you fly into SFO Terminal 3 (United Airlines Terminal) or into the International Terminal (G Gates), you can get to the Centurion Lounge without leaving security (assuming you do not need to clear customs). If you are connecting through or departing from SFO, just show your valid boarding pass to get through security and to the Centurion Lounge. Yes, if you show a boarding pass from a previous flight that does not depart from SFO, TSA will not let you through security. Hopefully you can access the SFO Centurion Lounge on your next trip through SFO. I fly Southwest out of Terminal 1 often. Although I love the Centurion lounge, is it easier to go to the Air France lounge in the International terminal (using Priority Pass)? It’s a shorter walk? I’ve never walked from the AF / KLM Lounge to the Southwest Airlines terminal. I have been to the lounge several times, but I prefer the food and drinks at the SFO Centurion Lounge to the AF / KLM Lounge. Have you ever had problems using your southwest ticket to clear security from Terminal G? No, as long as you tell them you are going to the lounge, you will get through security. Thanks for this post! Just to be clear – if you visit the Centurion Lounge but your flight is in Terminal 1 or 2, you will have to go through TSA/security again? Correct. Terminal 3 is not connected to Terminal 1 or 2. You will need to leave security and then go through TSA / security again at terminal 1 and 2. 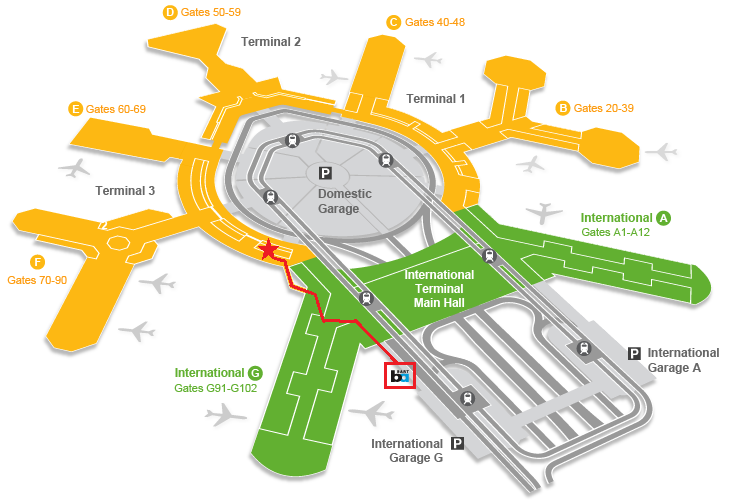 Can you walk from Terminal 3 to Terminal 2 inside the building or do you have to go back outside along the curb? All the terminals are connected, so you can walk inside the building the whole time. You will need to leave security though when going between certain terminals. Yes, that sounds correct. According to FlySFO (https://www.flysfo.com/content/air-france), Air France flies from Gates A. You will need to go through security to get to the SFO Centurion Lounge, leave security and go through security again at Gates A to get to your Air France flight.